Heat the oil over medium heat in a heavy-bottomed skillet. Add the sausages and cook on each side, undisturbed, until golden brown, about 5 minutes a side. Set on a baking dish in the oven to keep warm. To the same skillet, add the onions and stir to combine with the oil. Season the onions with salt and pepper and cook over medium-low heat, undisturbed, until the bottom of the onions begin to caramelize, about 10 minutes. Stir only once and cook for another 25 minutes, undisturbed. Once the onions are golden and soft, set aside. 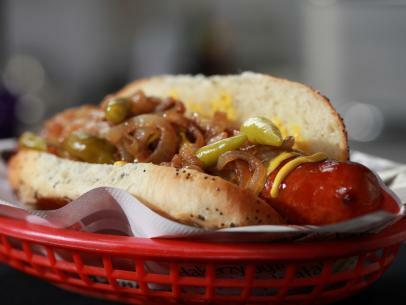 For the sandwich build: Place a sausage on a bun, slather in good yellow mustard, top with an ample amount of caramelized onions and 2 or 3 sport peppers. Wrap the sandwich in deli paper, parchment paper or foil. Let sit for 5 minutes to get all good and steamed up. Eat while standing with only TWO napkins and a giant pop. 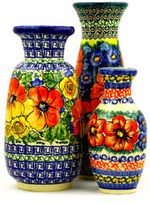 This entry was posted in Cooking with your Polish Pottery on July 9, 2015 by Sara.